a guesthouse, a barn, and dog kennels. It's set on 17 acres. 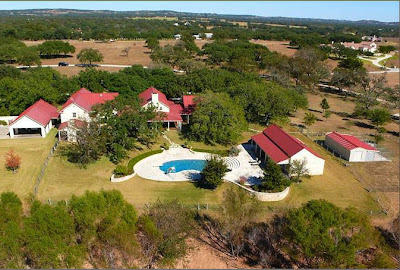 Highland Park native Ann Williams, whose Hill Country House blog has been a longtime favorite diversion, is selling her rambling estate outside of Fredericksburg where she and her husband have lived for almost 15 years and raised their children. When Ann and her husband Mike announced back in 1995 that they were moving from their house in Preston Hollow to the town of Fredericksburg -- leaving Mike's anesthesiology practice, and the so-called good life, behind -- their friends were horrified. "We had a lovely home, we drove nice cars, and Emma (their daughter) went to Greenhill," Ann wrote to me in an email recently. "One of Mike's younger associates asked him if we were crazy. His words were something to the effect of, 'You have made it -- you have all the things I am seeking.' He thought we had lost our minds." Their first home in Fredericksburg wasn't this grand. It was an 800 square foot farmhouse on 80 acres. They put their kids into public schools. Says Ann: "There are lots of affluent people who have second homes here and they are quite beautiful. We are part of the community, however, and our kids go to school with the children of our plumbers, our electricians, our housekeeper, as well as the children of the doctors and lawyers. We go to church with people of all socio-economic levels, and we love it. We chose to move here for the beauty of the hill country, but also so that our girls would grow up in this environment. "By Fredericksburg standards, it is large and a little ostentatious for my comfort. It really needs a full time caretaker and I have discovered that is not what I want to do with my life. So, to truly enjoy it, the new owners need to have lots of help so they can have fun with it!" "We have been here for a little over three years," says Ann. "It has been a fun house to share with others. We have hosted Christmas parties and lots of teen age parties. The back yard is huge and the pool has been a great source of entertainment for kids every summer. I love interior stone and this house has a ton of it. It is a classic Hill Country house built with amazing materials and details. But, it is more house than I want to manage, AND I still want to build again. "There is no one favorite memory - just good times in the backyard, eating on the screened in porch, and cooking in the huge kitchen with friends. We have an annual Christmas party and have about 8 couples - good friends who cook together, stay late, drink wine and talk around the dinner table, and at this point, are all aging together! We have been here long enough to have seen kids grow up and leave home for college and the military and it is quite special." To see more details on the house, go here.